RT-AFF was pleased to partner with our National Office to plan, manage and execute the 2018 AmeriCorps Members training and project days this August. RT-AFF volunteers Bard Jackson and Bob Austin joined consultant Armand Magnelli and RT-AFF staff member Don Ryan to conduct a one-day formal training in safe and healthy home repairs. They set-up hands-on work stations to demonstrate the right methods and materials for installing grab bars, gutters and downspouts, clothes dryer vents and other repairs. Behind the scenes, Marcy Bartlett, RT-AFF Director of Programs orchestrated the two day project where the AmeriCorps members would put their classroom training to work. We were fortunate that Marcy agreed to stay on for the month of August and put in a tremendous effort to make her last project for RT-AFF a successful and meaningful experience for the homeowners, AmeriCorps Members and RT-AFF volunteers. Our two low-income homeowners struggled to maintain their homes due to illness and disabilities and the health and safety hazards at each home were quite serious. For two days, 15 RT-AFF volunteers worked alongside the 33 AmeriCorps Members as task leaders, coaches and mentors. 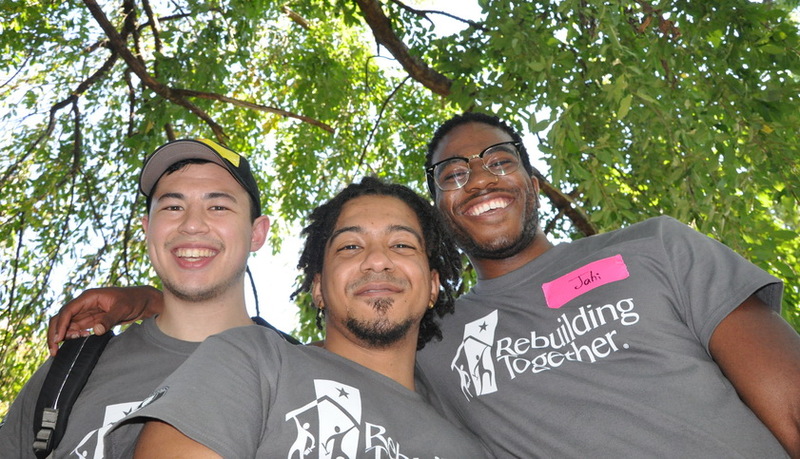 RT-AFF gave the AmeriCorps Members the opportunity to bring their classroom training to life during their first exposure to the hands-on work done by Rebuilding Together. Diverting water away from the foundation by digging a trench and installing pvc pipe and a pop-up emitter. RT-AFF volunteers and staff were gratified to help launch these AmeriCorps Members on the next leg of their journey serving 22 RT Affiliates around the country for the next 11 months. And everyone felt a tremendous amount of satisfaction from making the homes safe and healthy for the homeowners. Please take a look at our flickr albums for the two projects – you’ll see a lot of hardworking AmeriCorps Members and RT-AFF volunteers – and big smiles all around.